We had such a fun weekend in Austin filled with friends and food and lots of fun. I'm still exhausted just thinking about it. We started off our weekend by driving out to Thurman's Mansion in Driftwood for a rehearsal dinner for one of our best friends, Adam, and his beautiful bride Paige. We love them both so much and were so excited that they were finally tying the knot! 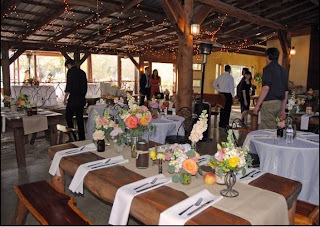 The rehearsal dinner was really casual; the back porch of the Mansion looks out over the Salt Lick and a vineyard. The Harveys brought horseshoes and footballs and bean bags for people to play with on the massive lawn, and it was fun to be outside surrounded by all the beautiful scenery. Dinner was good old fashioned Salt Lick barbecue - if you haven't been there, you must go. Many a night in college was spent trecking out to Driftwood for good food and good music - there's almost always a live band! Saturday, we got up and drove out to the lake. We were packing it in this weekend! We went to new Oasis complex, which is quite impressive. We ate at Uncle Billy's on the lake; it was so good and much better than the Oasis' food. With the same view but better food, it's a place I'm sure we will go to again and again. After lunch, we went back to the Arboretum and got Amy's Ice Cream and went shopping for Luke. It was a perfect afternoon! 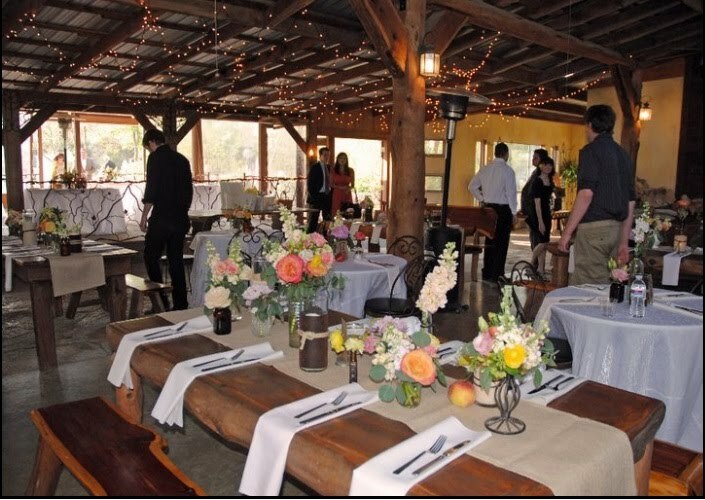 Saturday evening, we boarded a shuttle bus that took us out to Buda, Texas to the Kali Kate Equestrian Center for Paige and Adam's wedding. It was the most gorgeous wedding weather and the location was perfect for them! 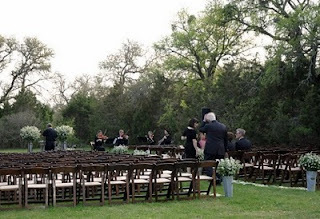 Paige is so creative - the wedding was outdoors and the reception was about 30 feet away in a large stone pavilion. It was stunning. As far as seating goes, this was by far the most creative way I've ever seen a seating arrangement displayed. Paige took old china plates and so beautifully wrote each name on a the plate that corresponded to the matching table number spoon. The pictures don't do it justice! The inside of the pavilion looked like it came straight out of a wedding magazine. Very eclectic, very vintage and very pretty! We went to the wedding with two of our best friends, Becca and Justin. We got to celebrate Justin getting matched to Austin/Houston for his neurology program and Jon's new job. We are so blessed to have such good friends in our lives that we can celebrate both little and big milestones with. We wrapped up the weekend with some Threadgill's with Jon's dad and brother and sister-in-law. It's so important to me to pack each weekend in Austin with our favorite things since we don't get down there nearly enough. We miss living there and getting to do those things all the time. I'm 22 weeks pregnant and a couple of days. It's really becoming quite obvious and quite uncomfortable, which I'm sure will only get much worse. I really have grown so much in the past 2 weeks; it's amazing how it just happens so quickly. Here are the highlights for this week! Movement: Felt Luke kick hard for the first time this week. The movement is pretty constant now and Jon felt it pretty faintly last night. Sleep: I'm sleeping pretty good! I wake up once or twice each night. What I miss: Skinny Ankles! Hahaha - but seriously, if I overdo it, even just a little, my ankles look terrible! Cravings: Sweets. Anything sweet will do - but chocolate and ice cream are my favorites. Symptoms: Just little aches and pains; nothing out of the ordinary! Best Moment this week: Feeling him really kick me for the first time. It's great to know he's active and growing as he should be! I've gotten so much accomplished this week to prepare for Luke! We registered, which was pretty daunting considering we have no idea what we are going to need. 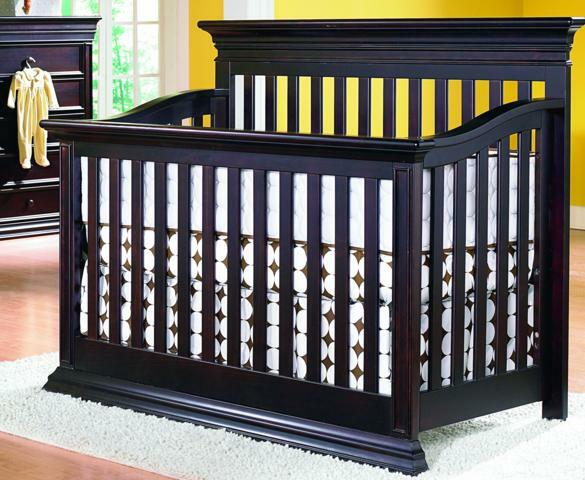 We went and ordered all of the baby furniture for his room, and we shipped all the bedding fabrics to my mother-in-law who is making the bedding (I am so excited to see how it turns out!). My cousin and go-to-decorating-girl Kim suggested we do a vintage football theme after I texted her a picture of an old wooden painting of a UT/OU game from 1937 that I bought. I loved the idea and have run with it. It's been fun buying old UT football programs to frame and buying accessories that will work in his room for years to come. I think my favorite one so far has been the old intercollegiate football I found in a bin at Canton last week. Here's a sneak peak at some of the furniture we chose. 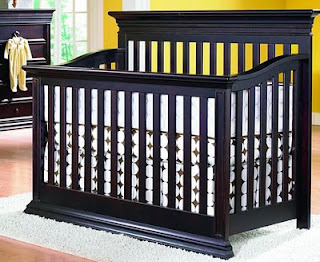 The furniture is Baby's Dream Legendary in Espresso. We got the crib, a double dresser with a changing table top that can be taken off later and a really large bookcase for all those books we've been collecting. We chose this particular set because we feel like we can use the pieces for years to come. I can't find a picture of my exact chair (Little Castle - Treasure), but it looks almost exactly the same as the above picture. 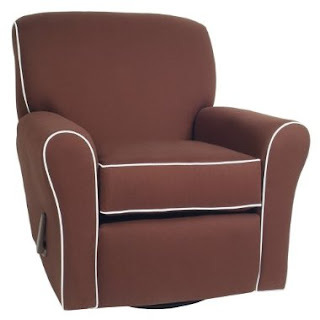 We chose a recliner since we think it will work better in our 10x10 nursery to not have an ottoman. The only difference between our chair and the one pictured is that the recliner handle is inside the chair cushion for safety. I love this chair because it's super comfy and I think that's important if I'm going to be spending a ton of time in it. Movement: Felt him a little more this week, especially during the day! Haven't felt a strong kick yet; I still feel like I'm on a roller coaster that doesn't stop. What I miss: I miss going shopping all day long or being out all day long and not getting tired. I tried to venture out on all-day gigs the past 2 weekends (Canton Trade Days and St. Patrick's Day in Dallas) in a row and it wore me out. I was in bed last night at 7:30 with my feet propped up. Best Moment this week: Realizing that I am over half way done with this pregnancy and that in less than 20 weeks, I get to meet my little guy. Well, we've had a crazy turn of events around here. About a week ago, I went in for my 20 week ultrasound and was told that they had make a mistake; I am actually going to have a boy! I had bought so much girl stuff and was getting so excited at the thought of big hair bows and smocked dresses, so I was a little shocked. BUT, I have always wanted a boy, so it was a pleasant surprise. I laughed so hard and Jon just said "I told you to wait to buy anything..." Needless to say, we spent that day returning girl clothes and packing away the things that weren't returnable. Thank goodness I hadn't bought furniture or anything too major! We are excited to welcome this little boy into the world in less than 20 weeks and I have been having so much fun hunting for cute boy stuff. For all you girl moms out there, believe me, it is a hunt. Boy mamas, leave me a comment as to where you shop; all of you who have little boys and write blogs seem to always have the cutest dressed kiddos. Movement: Starting to feel like I'm on a roller coaster that doesn't stop. What I miss: Alcohol. I'm being honest here, but this mama likes her wine (and beer and...). It sounds so terrible, but it's true! Cravings: Peanut M&Ms and cheeseburgers. Healthy, I know. Best Moment this week: Getting past the halfway mark and finding out the true gender. I've already gotten lots of things monogrammed this week. We also got to pick out all the fabric for Luke's bedding and I've started buying stuff for his room - it's going to be so nice! And, here's a pic of my 20 week self. I definitely feel like I've gained a whole lot more than 4 pounds!